You know what’s a scary thought? Renting a vehicle from a car rental company and then finding out that it’s part of a recall, but was never brought in for the necessary repairs. Then there you are, driving a potentially dangerous vehicle. We’re kind of surprised it took this long, but now Enterprise, Hertz, Avis, Dollar Thrifty and National have agreed to stop leasing vehicles under safety recalls. Democratic Sens. Charles Schumer of New York and Barbara Boxer of California told The Associated Press that the five companies will pave the way for new legislation covering the rental industry. The bill is likely going to be voted on during the next lame duck session coming up in Congress. “This historic agreement will be a major improvement in auto safety, particularly since rental car companies are the largest purchases of new vehicles in the nation,” said a statement by a coalition of consumer groups and relatives of two women who had died in a car fire in a rental vehicle that was under a safety recall. The two women were sisters who were traveling in a rental car in 2004 that had been included in a recall for a power steering hose defect. It hadn’t been repaired, and a car fire started, killing both women in a head-on crash. In February 2012, the mother of the two women launched a petition on Change.org to get the government to change its rules on rental car companies with recalled vehicles. She says she’s happy her efforts have paid off and could help others avoid what her family has gone through. 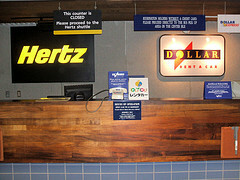 The five companies involved cover 90% of the rental car industry, which makes their support a pretty huge move. There’s currently no law to prevent the leasing of cars under safety recalls.